Tag Archive | "World Cup"
By far, some of the major cost factors that are associated with hosting the World Cup tournament consist of spending on the development of infrastructure, improvement of transportation system and various tourism related accommodations. In the case of Qatar, however, the variable that would have to be factored into the final equation are lives of hundreds of migrant workers lost on the construction sites since the commencement of the 2022 World Cup project due to ill working and living conditions. 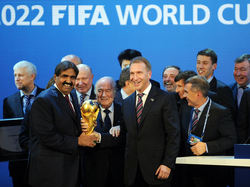 On December 2, 2010, when the FIFA Executive Committee announced Qatar’s winning the bid to host the 2022 World Cup, thousands of Qataris gathered on the streets to celebrate the news. This event has put the country in the global spotlight. It will be the first time in the history that the World Cup is held in an Arab state. For many, this event is seen as a historic opportunity to bridge the gap between East and West. There is no doubt that Qatar is financially capable to undertake such a large-scale project. In fact, due to its enormous oil and gas reserves and free market economy, this tiny Gulf country is officially the world’s wealthiest country per capita. It planned to spend $200 billion on building new infrastructure in preparation for the 2022 World Cup, including a new airport, roads, subways, hotels and football stadiums. One of the main factors that played against the Qatar’s bid, though, was the weather. Of the countries running for the 2018 and 2022 tournaments, Qatar was ranked as the only “high risk” candidate because summer temperatures, which can reach 120 degrees Fahrenheit, could pose a serious threat to the health of the athletes. However, the Chief Executive Officer of Qatar World Cup bid Committee assured that the “stadiums, training sites, fans zones and other outdoor areas” will employ hi-tech cooling technology to provide comfortable temperatures for athletes and thousands of visiting fans from around the world. Emir of the State of Qatar Sheikh Hamad bin Khalifa Al-Thani (left) and Fifa President Sepp Blatter pose with the World Cup after the Qatar announcement in 2010. These reassurances certainly evidenced that the government is taking the concern over the health and the well-being of the players and fans very seriously. However, a September 2013 exposé by the Guardian revealed Qatar’s appalling failure to protect and prevent serious exploitation of migrant workers who are directly involved in the World Cup construction project. The report put the nation in the spotlight once again, stating that nearly 900 workers have died in Qatar since the construction of the World Cup commenced in 2012. Many of these workers were killed by sudden heart attack and workplace accidents caused by overwork and lack of adequate health and safety practices. The report sparked international outrage and criticism over government’s treatment of migrant workers. According to a Report of the Special Rapporteur on the human rights of migrants, Qatar currently has the highest percentage of migrant workers in the world – approximately 88% of total population of 1.9 million is immigrants. These workers come to Qatar with the hope that their income will enable them to provide financial support to their families back home. Driven by poverty, they often take out large loans to pay high recruitment fees for a promise of well-paid jobs in Qatar. Instead, upon arrival, they end up in jobs where conditions and wages differ significantly from what was originally promised. Many of these employees live in overcrowded and unsanitary labor camps which lack electricity and air conditioning. Detailed investigations conducted by Human Rights Watch and Amnesty International in 2011 highlighted widespread violations of migrant workers’ rights, including dangerous working conditions or not being paid wages, sometimes for months. Many of the problems are rooted in “kafala”, an employee sponsorship system that ties a foreign worker to a single employer who sponsors the visa in Qatar. Under this system, migrant workers are not allowed to change their jobs without the employer’s permission (so called No-Objection Certificate). Also, the existence of the “exit permit” system, that requires employees to obtain employer’s consent before leaving the country, gives employers ultimate power over their foreign employees. Further, Qatari law prohibits migrant workers from joining or forming trade unions, so workers cannot engage in strikes to voice their problems and find solutions to their dire circumstances. Prevented from changing jobs or leaving the country, these workers have no choice but to accept low wages and poor living and working conditions. Many human rights groups have criticized Qatar’s kafala system of employment and urged the government to abolish or revise these controversial laws which facilitate the exploitation of migrant workers. In May 2014, in response to worldwide condemnation of the contentious laws, the Qatari government announced its plans to reform the kafala system. The proposed reforms were based on the recommendations by DLA Piper, an international law firm, which was instructed by the government to prepare an independent report examining the situation of migrant workers. According to a statement made by human rights director of the Qatari interior ministry, Colonel Abdullah Saqr al-Mohannadi, the new law would modify the exit visa system by allowing migrant workers to exit the country without their employer’s consent. Instead, a new e-government system would automatically issue exit visas to a foreign employee after 72- hour grace period prior to any departure. The government’s announcement of its decision to make fundamental changes to the existing laws elicited hope in millions of people throughout the international community that Qatar would provide long-awaited protection for foreign workers, and finally eliminate its controversial system of employment. However, according to a brief published by the Amnesty international in November, 2014, six months after the announcement, “Qatar is still failing on workers’ rights”. Despite its promises to abolish the kafala sponsorship system and to replace its “exit visa” system, the government has taken no steps to implement these changes. There is no doubt that Qatar depends on the foreign labor to help realize its grandiose 2022 World Cup vision. If the government continues its abusive employment practices, International Trade Union Confederation warns that more than 4,000 more workers will die by the end of the construction project. Qatar must take immediate steps to avoid this. Otherwise, the world’s most popular sporting tournament will go down in history as an event “built on forced labor and exploitation” of hundreds of lives. Jeyla Zeynalova is a 2LE at University of Denver Sturm College of Law and a Staff Editor for the Denver Journal of International Law and Policy.